Released on Epic Records. Review by A. Weird Daft Devil. … And then, lamely citing economic concerns, the record company rejects the idea of a double album, the proposed track listing, and even the original artwork. The original Side One is kept intact but the remaining fourteen songs are whittled down to just six to fit onto Side Two of a vinyl album. A single album version of Secret Messages is unveiled to the World on 24th June 1983. This 2018 release restores seven tracks that trickled out of the vaults between 1983-2001 and returns Secret Messages to its original sequence. The result is an embarrassment of riches as ten tracks from an already excellent album reconfigure and coalesce around others that should always have been there. 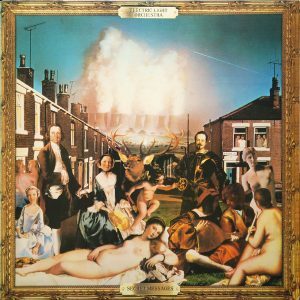 ‘Secret Messages’ is as strong and enigmatic an opener as you could wish for; ‘Stranger’ and ‘Train Of Gold’ are quality songs in the classic ELO tradition; ‘Time After Time’ (featuring Jeff’s then-wife Sandi on backing vocals) is a brilliant but chilling evocation of imminent nuclear annihilation; ‘Buildings Have Eyes’ is deft string-laden pop; ‘Danger Ahead’ is surging classic rock that allows Bev Bevan to cut loose whilst ‘Rock N Roll Is King’ (featuring a cameo appearance from Mik Kaminski) demonstrates Jeff’s instinctive feel for fifties rock ‘n’ roll. The magnum opus of Secret Messages however is unquestionably its closing track, ‘Hello My Old Friend’. The song is an affectionate portrait of the Birmingham Jeff Lynne grew up in, replete with local references (‘Spatch and Mail!’). It gradually builds to a crescendo, disintegrates into an ambient mid-section before returning for a Beatle-esque ending, complete with a descending guitar riff that echoes ‘10538 Overture’, an orchestral motif directly borrowed from ‘The Diary of Horace Wimp’ and looped tape effects. For a band whose initial vision was to pick up where the Beatles had left off with ‘Strawberry Fields Forever’ and ‘I Am The Walrus’ it would have been the perfect closing statement. If you haven’t heard it, then the album is worth buying for this one track alone. Yet I would have liked this release to have gone even further. Currently this double album is available on vinyl only (although it comes with a digital download code) but surely a CD reissue is way overdue. Replicating the inner lyric sleeves (in tandem with the 1983 edition) and updating the credits to include the additional tracks would also have shown more attention to detail. Significantly too this release omits ‘Beatles Forever’ – the one remaining unreleased track from the original double album. Whatever the merits of the song – and opinion is divided on that score – its absence is a disappointment and a missed opportunity to finally present Secret Messages as originally conceived. Its intended position on the album (between ‘No Way Out’ and ‘Letter From Spain’) also means that Side Two doesn’t flow as well as it might otherwise have done. The single album version of Secret Messages was excellent but in its original double album form it was magnificent. This release, frustratingly, may not be all that it could have been, but it’s the closest to the complete version that we’ve ever had. Despite its flaws I am thankful that one of my all-time favourite albums finally exists in a tangible, physical form after all these years. If only it could all have been done 35 years ago!